The impact of the Central and Eastern European economies' trade integration with European markets on CEE trade structures has been studied extensively. These studies frequently observe a quality upgrading of CEE exports. In this paper we consider three dimensions of quality upgrading: upgrading across industries, upgrading across different quality segments within industries and, finally, product upgrading within quality segments inside industries. For the analysis we partition industries into quality segments based on EU-15 import unit values. 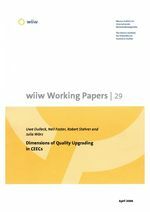 The results for ten CEE countries (comprising the CEE-5, the Baltics and Southeastern Europe) and thirteen industries suggest fundamental differences, both across country groups and across the three different notions of quality upgrading. The CEE-5 show no evidence of entering a 'low-quality trap' in all three dimensions. By contrast, while there is a general catching-up process across industries and inside quality segments, the second notion of low-quality specialization may be applicable within the high-tech industries to the performance of the Baltics and Southeast Europe as a group.